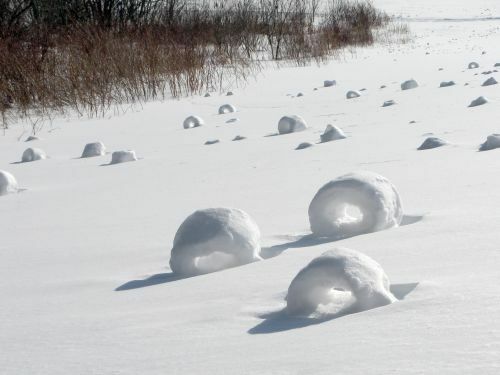 These strange-looking images of rolled snow above are called “snow rollers” and yes, they are formed naturally! A rare occurrence, snow rollers only form during limiting conditions. The National Geographic describes this weather phenomena as the weather equivalent of tumbleweeds. This hints that wind is what pushes the snow into these rolls. But why doesn’t this happen more often? Snow rollers only form when weather conditions have “the right mixture of moisture, snow, wind, and temperature.” The National Geographic further describes these conditions as there having to be a layer of ice with a layer of light snow on top and it must be wet enough for the snow to stick to itself. Also, winds must be around 30 mph. Not only can snow rollers be formed by wind but, in some cases they form, by rolling downhill. As a snow rollers accumulate snow, it leaves a track behind, showing where they’ve traveled. The formation of a snow roller is very similar to the way snowmen are made. Some have compared snow rollers to the giant snowballs that roll downhill in a cartoon. 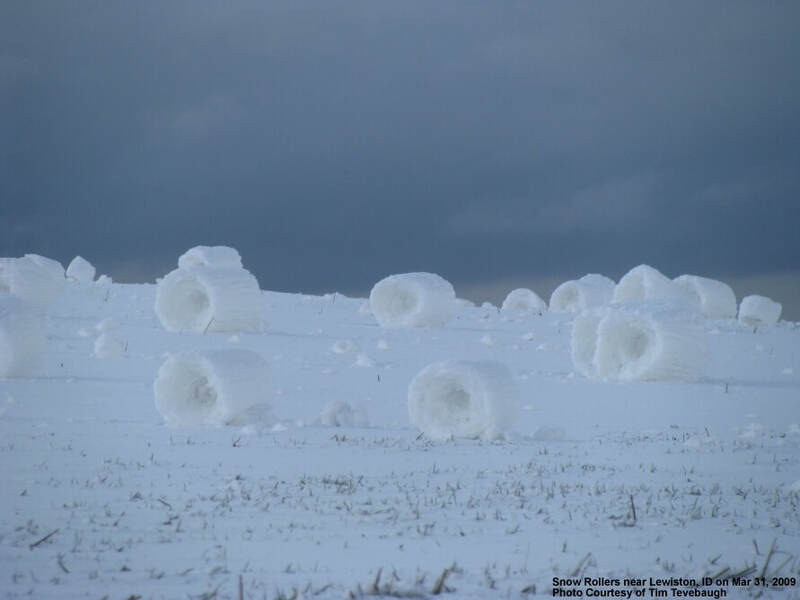 They have been referred to as “snow donuts” or “snow bails”. 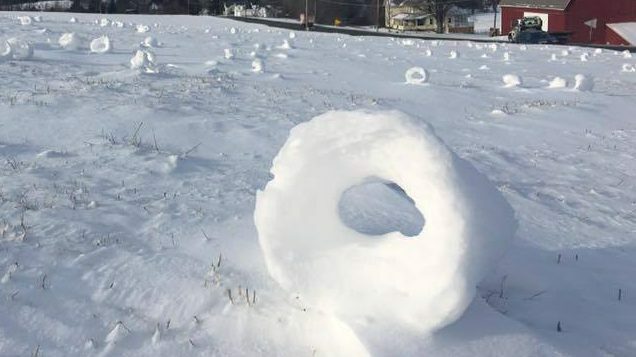 Some snow rollers form with a hollow center and some are packed in a swirl, similar to a cinnamon bun! Here are some pictures of the two different forms. 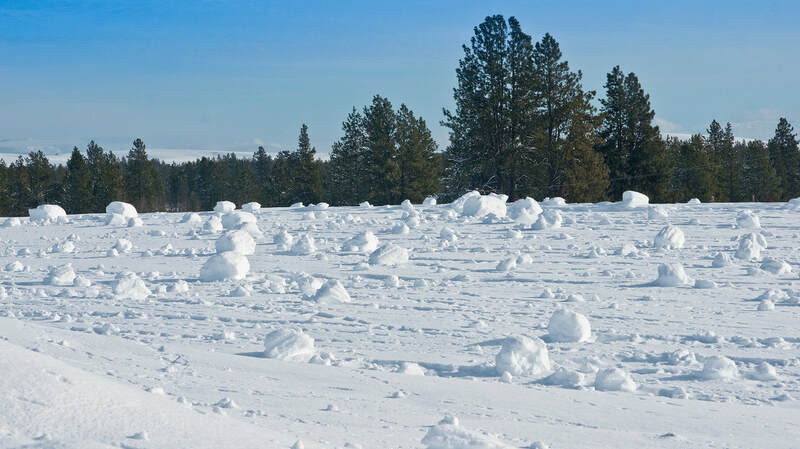 To learn about documented snow roller events, The National Weather Service archives a few articles regarding the phenomenon.These articles include the event of December 2008 in eastern Washington and the event of March 2009 in Idaho. Some pictures the National Weather Service posted of these snow rollers can be seen below. Snow rollers are just nature's anomaly. They are never dangerous, just a rare but pretty weather phenomenon. With the single digit high temperatures and the below freezing lows now behind us, let’s see how those bone-chilling temperatures helped with ice coverage on the Great Lakes. As shown in the graphic above, the total ice coverage on the Great Lakes is roughly 66.1%. This time last year the total lake ice coverage was about 42.2%. The roughly 24% difference from 2018 to 2019 can be attributed to the above-average temperatures in December and the rapid turn-around, (i.e., 80 degree Fahrenheit temperature change), that was experienced once the polar vortex impacted the Great Lakes region. Believe it or not, ice-coverage is vital to the Great Lakes watershed and various ecosystems therein. Ice coverage acts as an evaporation shield to help keep the lake water from being evaporated into the atmosphere. This also reduces the amount of moisture in the atmosphere which helps to provide a source for extra low-level moisture which can often help fuel winter storms. With less ice coverage, this will produce more evaporation which, in turn, will cause more precipitation. 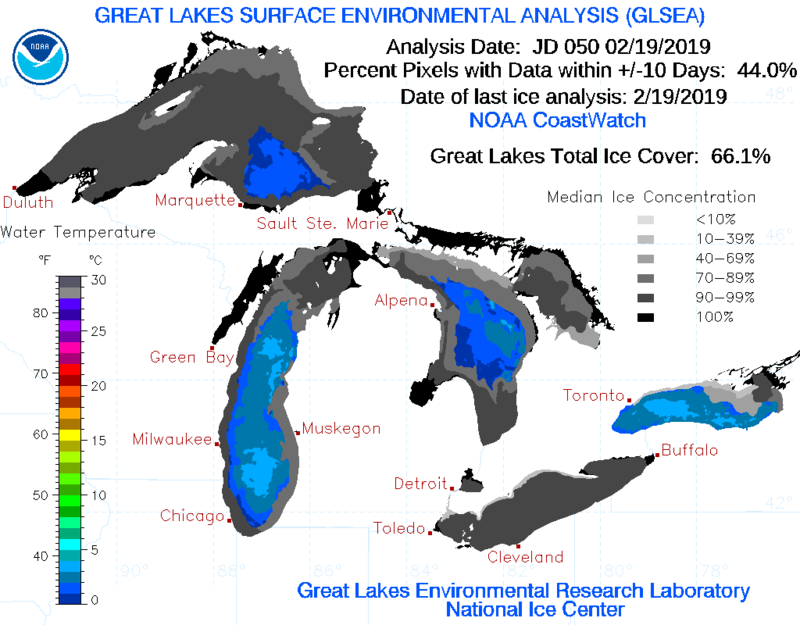 As previously mentioned, ice on the Great Lakes acts as an “evaporation seal”—diminishing the amount of moisture being brought up to the atmosphere. The availability of more moisture in the atmosphere is what helps build winter storms, which feed off of moisture from the Great Lakes. The growing percentage of ice also helps with the region’s albedo. Albedo is the ratio of incoming radiation that is absorbed and reflected. Ice and snow, which reflects incoming solar radiation, have a high albedo due to their high reflectivity. Whereas black pavement for instance, has a low albedo to due to its lack of reflectivity and high absorption of solar radiation. In addition to albedo, ice on the Great Lakes helps regulate the ecosystem. Plankton, for instance, rely on ice to protect their populations because when ice forms over their habitat, they become more resilient and protected from warmer temperatures. Harmful algal blooms that occur in Lake Erie every year are regulated by ice because of the bacteria that causes the blooms, are killed off. A year with low Great Lakes sea ice and a year with high Great Lakes sea ice are polar opposite in comparison. This year for instance, as of right now, we are above the 55% long-term average for lake ice. For more ice data and historical ice data visit GLERL’s website here. The first thought most people have when they think of winter is one thing: snow. Winters are known mostly for the white, frozen precipitation that occurs when all levels of the atmosphere (and the surface) are at the freezing mark (32 Degrees FahreNheit/0 Degrees Celsius). What happens, though, when not all levels of the troposphere, the lowest region of the atmosphere where all of our weather occurs, are below freezing? Let’s explore that idea. The troposphere is somewhat complex. It is roughly the first 10km of the atmosphere, and is often measured in terms of pressure (millibars). When precipitation occurs, it falls through various levels of the atmosphere, often travelling through different temperatures that alter the formation of whatever precipitation is falling. When the precipitation is rain that means the temperature is above the freezing mark through at least the first couple hundred millibars of the atmosphere. However, it is often not the case that all levels of the atmosphere are above freezing, especially over much of the continental U.S. In the winter, the atmosphere goes through dramatic changes in temperature; there are different air masses that can occupy different levels. When it comes to sleet, there is likely a shallow layer of warm air in between two layers of sub-freezing temperatures. As ice crystals fall into the shallow warm layer, they melt, but only enough to melt the outer layer of the ice. As they pass through the colder layer nearest to the ground, water droplets freeze on an ice nucleus, the remaining center of the ice crystal, thereby creating sleet. Freezing rain is a different story. Freezing rain occurs when a much deeper warm, layer is wedged above a shallow cold layer near the ground. The warm layer melts ice crystals to the point where they are rain droplets. When they pass through the shallow cold layer near the ground, they freeze on contact with any sub-freezing surface on the ground. This phenomenon occurs closer to the warm front of a cyclonic low pressure system than sleet, as the warm air is able to penetrate deeper into the atmosphere. Its freezing rain and sleet, not snow, that often cause the most hazards to the general population. Both types of precipitation are known for the slick effect they have on roadways. They can cause black ice, or icy spots on roadways or sidewalks that are hard to spot due to their clear color. This issue is even more of a problem on elevated surfaces such as bridges and overpasses where both sides are surrounded by open air, allowing surfaces to freeze more rapidly. The Occupational Safety and Health Administration (OSHA) also advises people to be more careful when icy weather hits. Their website lists two steps people can take to greatly reduce their risk of a life-threatening fall: wear rubber over-shoes with good treads and take slower, smaller steps. The U.S. Department of Transportation has recorded, based on a ten-year average, over 1,800 deaths annually related to snow and icy roads. Drive safely, minimize travel in the dead of winter, and be smart and we can keep that statistic from growing even more. To learn more about other winter weather topics, click here! ​In the North Pole, the polar vortex is usually found as a strong upper-level low pressure that is confined to that area. Under the current circumstances, warm air has made its way into that area which weakens the vortex, causing a split into multiple vortices that can travel away from its natural location. Due to this phenomenon, the polar vortex is slated to move into the United States overnight and into the morning of Wednesday, January 30th. There are many discussions explaining the extreme cold temperatures with comparisons to previous events. A similar cold air outbreak occurred in the region on January 5, 2014 which set records for cities over Illinois, Wisconsin and Minnesota. The current event is being referred to as a “generation spanning event” by local news stations, likely because of the comparisons from the previous generation that experienced an event like this in 1985. Specifically, the coldest temperature ever recorded in Chicago at the O’hare International Airport station was -27℉ back on January 20, 1985 (from NWS Chicago). Other stations in the Northern Illinois region that day may have actually been colder than that! 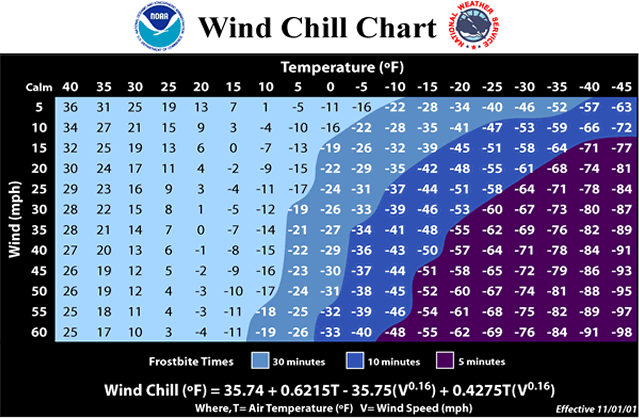 Along with the discussion of historic cold temperatures, must be a talk about equally historic wind chill values. 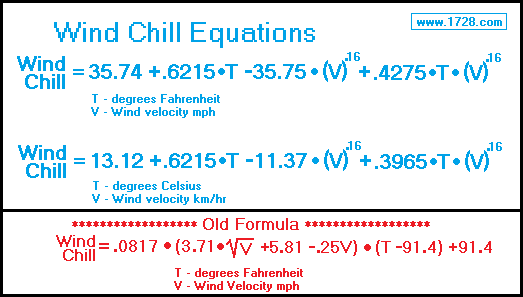 The next graphic from the Golden Gate Weather Services (https://www.ggweather.com/windchill.htm)​ demonstrates the difference of wind chill calculations from past and present. 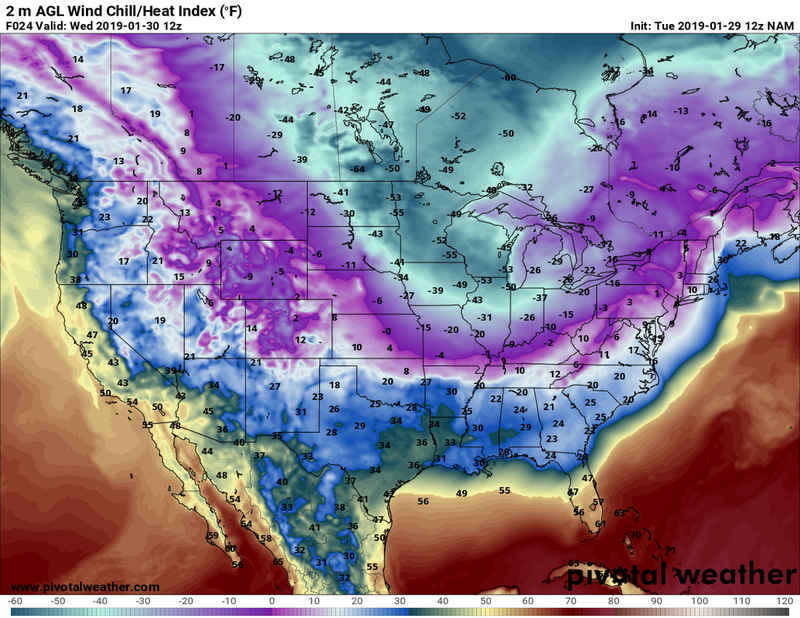 Popular social media outlets are comparing the severe wind chill event from 1985 in Chicago being record-breaking with wind chills in the 70 to 80 degree below-zero range, to the event that is occurring tomorrow, the 30th of January. What makes this interesting is that in November 2001, National Weather Service determined a more elaborate formula to calculate wind chill that is deemed more accurate, and may better reflect reality. Using the above graphics with an example, prior to 2001, a -20 degree Fahrenheit temperature reading with 35 mph wind speed was suggested to feel like -82℉. Today, with the new calculation and the same variables, that would feel like -55℉. Regardless of comparison, it will certainly be dangerously and historically cold tomorrow (1/30) and the proper precautions are necessary to remain safe. ​To learn more about other interesting winter weather topics from around the world, click here! A weakening polar vortex has unleashed extremely cold air that is beginning to propagate southward into the Central U.S. Multiple cities will experience record breaking cold that most of us haven't seen in quite some time. The arctic air, together with brisk winds, will lead not only to dangerously cold wind chill values but extremely dangerous weather conditions. It is important during this type of event to take any warning seriously and to take as many safety precautions as possible to ensure the highest rate of safety for yourself and others. Wind Chill Warning: Take Action! NWS issues a wind chill warning when dangerously cold wind chill values are expected or occurring. If you are in an area with a wind chill warning, avoid going outside during the coldest parts of the day. If you do go outside, dress in layers, cover exposed skin, and make sure at least one other person knows your whereabouts. Update them when you arrive safely at your destination. Wind Chill Warnings will begin to go into effect tonight and will last through the day on Wednesday & Thursday. Wind chills during this time frame will be extremely dangerous and range from -35° to -55°. 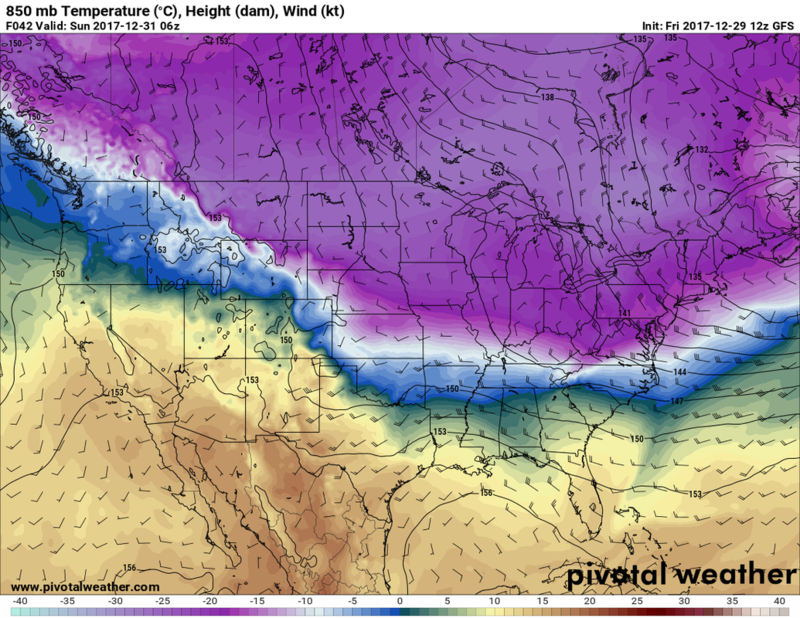 Morning low temperatures on both Wednesday & Thursday look to be between -20° and -35° across portions of the central U.S. This is very dangerous cold air that we are going to be dealing with throughout the next 48 hours. Below is a chart provided by the NWS on how fast frostbite can occur in certain extreme cold conditions. With how extremely cold this arctic air mass is, it is important to follow these safety procedures to not only ensure your safety, but the safety of everyone around you. To make sure you and your family are safe from the cold, make sure to dress up in multiple layers and cover any exposed skin. Frostbite can occur within 5 to 10 minutes of being outside in this type of extremely cold weather. So it is important to limit your time outdoors and stay indoors as much as possible. Same thing goes for your pets. Remember, your pets are family too so they should be given same amount of love and safety as you. Bring any outdoor pets inside and limit their time outdoors. When you take them outside, cover their paws. Then once you are back inside, check their paws to see if any symptoms of frostbite are present. Also, make sure that they have plenty of food and water before the cold hits. It will not be a good idea to go get pet supplies during the extreme cold event because you are putting not only your pet at risk, but you as well. Cold temperatures will also have an effect on your cars engine as well. When it is this cold outside, the engine fuel becomes thicker causing it to not flow through the engine as smoothly as it should. The extremely cold air also causes car batteries to drain quicker than when it is hot outside. And if there is any moisture in the fuel lines of the engine, it will freeze up causing a blockage which will allow the engine to not start properly. To make sure that your car starts up properly, put it in somewhere where it is warmer like a parking garage, a shelter, or in your own garage. This is to ensure that if you have to travel somewhere, your car won't have any problem starting up. But if by chance you have to travel, make sure that your gas tank is a least half full. To fully prepare for traveling in the extreme cold, it would be wise to fill up your gas tank before the record cold air moves in. Another important thing to check is your coolant. Make sure that you fill your coolant fluid so that the car warms up quicker and doesn't have any trouble performing while traveling. Always make sure someone in your family knows that you are traveling so that if you have any problems on the road, someone will be there to help! Once the arctic blast has fully moved out of your area, here are few things to keep in check. The top priority is to check to see that your family, and neighbors are okay after the cold blast. Power outages can occur during the extreme cold and can expose a person to not only frostbite but to hypothermia as well. Area of the human body that are most prone to frostbite are uncovered skin and the extremities, such as hands and feet. Be sure to check your pipes because they may be frozen. Especially the water pipes located on outside walls and in places that are subject to the cold, like in your basement or underneath your kitchen cabinets, will freeze during a cold blast. When water freezes up, it cause the pipes to also expand and burst. A good way to warm the pipes back up is to first turn on the faucet and let water drip. If you want a quicker way to heat the pipes, try using a space heater, electric hair dryer, or hot water on a cloth. Continue these processes until water pressure returns to normal. ​For more winter weather topics, click here. 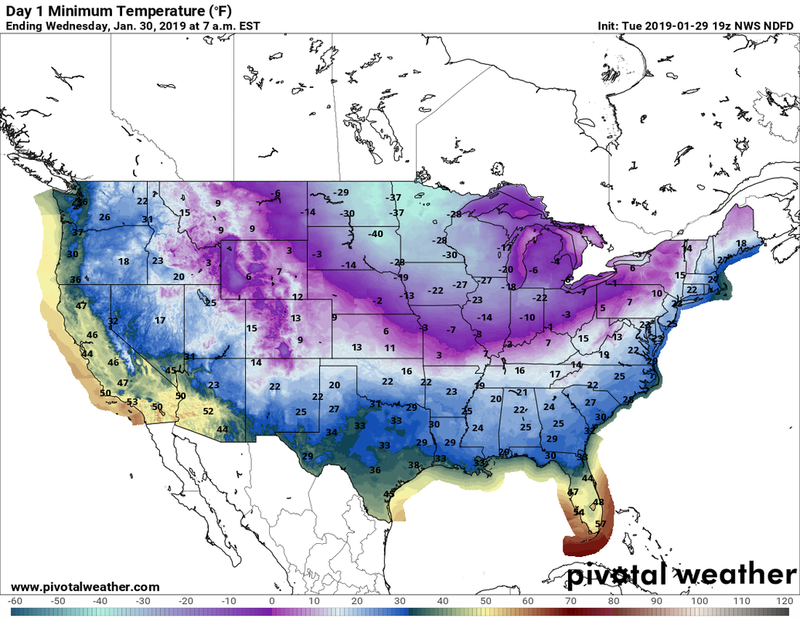 DISCUSSION: After a relatively warm start to the winter across much of the United States, winter has decided to show its face. Forecasters in the National Weather Service (NWS) are becoming more confident that as the month of January draws to a close, extreme cold will progress southward from the pole. 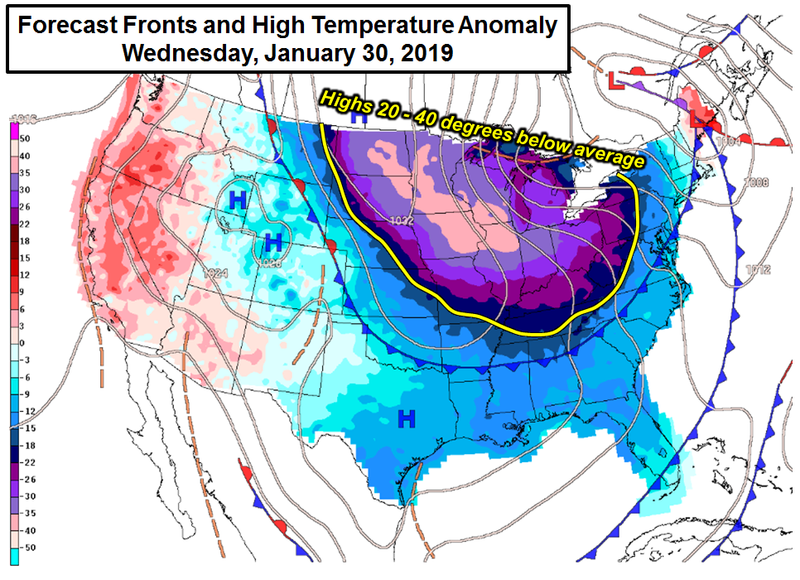 The brutal cold will move into the Northern Plains, the Midwest and the Great Lakes, with the dangerously cold temperatures starting to move into these areas Monday, Jan 28 2019, with the coldest temperatures around mid-week. The Northeast and the Mid-Atlantic will also feel the chill from this article blast, but the cold temperatures will likely not be as extreme in these regions. The forecasted severe cold is the result of a portion of the polar vortex splitting from its center near the north pole, moving southward; for more information on the Polar Vortex please click here. Portions of the Northern Midwest are already feeling the effects of the arctic blast. Overnight, temperatures in northern Minnesota dropped below -30˚F in some locations. When the wind chill was factored in, it felt like -50 ˚F in portions of the region. As the poral vortex moves southward, places as far south as Nashville could see their temperatures 20-40 ˚F below average for this time year. To make matters worse, it is expected to be windy, resulting in dangerously cold wind chill temperatures. Overall, the general thinking is that most of the Northern Plains, the Midwest and the Great Lakes will see lows between -20˚F and -30 ˚F. The areas closest to the core of the vortex will see lows below -40 ˚F. 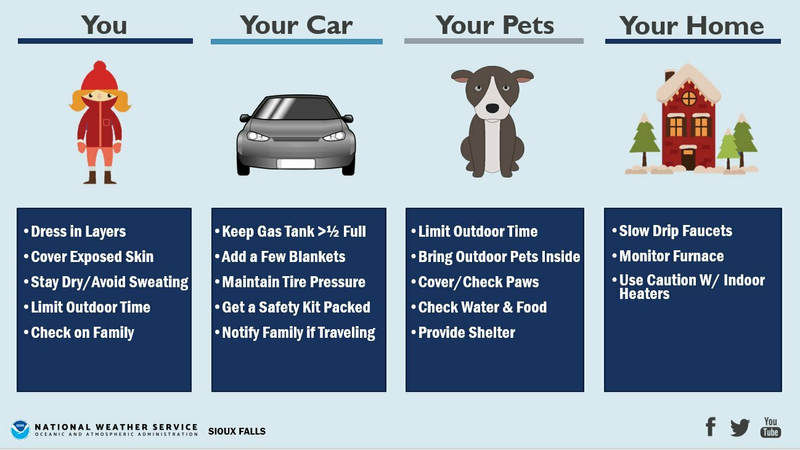 Many NWS offices across the Northern Plains, the Midwest and the Great Lakes are preparing for the brutal cold by creating graphics for the public, such as the one below done by NWS Detroit, which includes not only the forecasted chilly temperatures but also safety tips. For more safety tips about extreme cold please click here. In addition to the severe cold, heavy snow is also likely across the Upper Midwest and the Great Lakes. A clipper system is forecasted to move into North Dakota late tonight. By Monday it is expected to be somewhere over the eastern Iowa and western Wisconsin region. 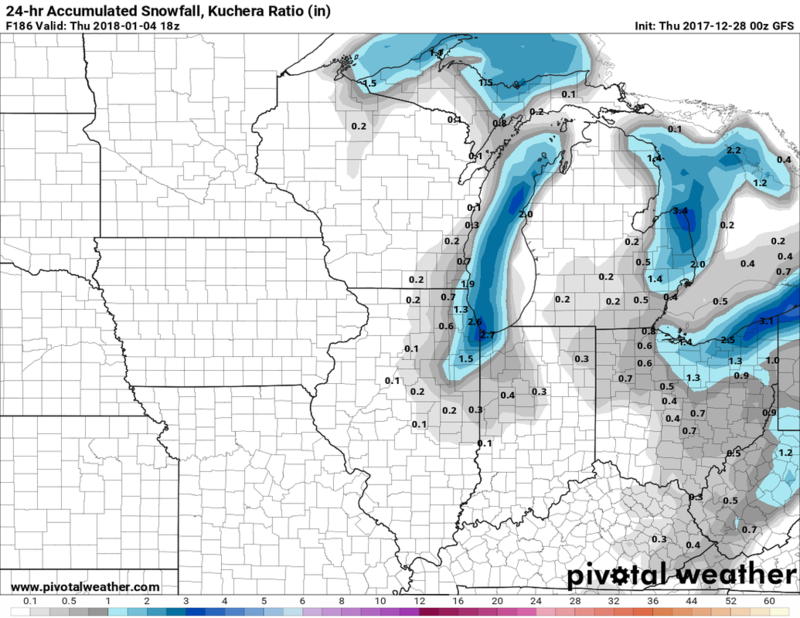 This system is forecasted to bring heavy snowfall to the Upper Great Lakes region on Monday, with a possibility of snowfall amounts greater than a foot. It will continue eastward, bringing snow into the lower Great Lakes Monday night into Tuesday. For more winter weather topics, click here. © 2019 Meteorologist Sarah Trojniak, Ph.D.
Photo: 24-Hour Accumulated snowfall map showing lake effect snows bringing accumulation to lake adjacent areas. Map generated from pivotalweather.com on December 28, 2017. As December has come and gone and we are knee deep in Meteorological Winter, the discussion of winter weather in the Midwest usually starts with strong cyclones passing through the continental United States bringing anything from blizzards to the north and strong thunderstorms to the south. We can steer our focus into something on a smaller scale (or mesoscale) and focus on the Great Lakes region, specifically on lake effect snow. The importance of understanding lake effect snow lies in the fact that it is convectively induced (similar to thunderstorms in the summer), thus is often very intense compared to other systems. The snow-to-liquid ratio for lake effect snow can range from 15 to up to 30 inches of snow per one inch of liquid, compared to 10:1 for other systems as a general ratio. Bands of lake effect snow can fall at intense rates of 2-3 inches in the matter of one hour and can be very localized in nature based on the size of the snow band. Snowfall forecasts can often be misleading if we are unaware of the ratio during a given system. The general rule of thumb with these snows is when cold air passes over a generally warmer lake, the temperature differential causes rising motions over the lake producing a cloud and eventual strong snow. The first area of concern is the time of the season which the lake will be at its warmest and first rushes of cold air approach the region. The time of concern is usually between November and January since the lake waters have had an entire summer prior to warm up (average for this time span are usually between 40 and 50 degrees). Development of the bands could be halted later in the season due to the lake temperatures approaching freezing and actually beginning to freeze. At this point we are not only seeing cooler lake surface temperatures but also less area for colder air to travel over the lake. Looking at model output maps, we focus attention on the 850 millibar (mb) height, temperature, and wind direction overlays. The 850 mb level helps to show advection (transfer) of cold air over a lake as well as the potential for steepening the lapse rate for rising air, which would allow for greater snowfall production. In order for the production of lake effect snow to occur, there must be a temperature difference between the lake water and air at the 850mb level (nearly 1 mile above the surface) of at least 13 degrees Celsius (55.4 degrees Fahrenheit). Another factor that plays into duration of lake effect snow is the time of day. For example, the coldest temperatures are typically going to be found not only after the passing of a cold front, but usually throughout the night. A band forming in the evening and lasting through the night could result in a higher strength of the band and more significant travel difficulty. Verification can be found by examining soundings (vertical profile of the atmosphere) to tell us if a strong lapse rate (change in temperature with height) exists and the strength or location of a dendritic growth zone (DGZ – used to determine the area of snowflake creation in the atmosphere). The final variable to verify your results would be composite reflectivity which would show a projected radar image of the future that should output bands of lake effect snow if the variables are there. Lake effect snow bands are different from most other snows that there are usually more intense snowfalls in a short time period. These storms can also occur during large scale high pressure, which can be deceiving for a storm to pass in a moment’s notice, only to have the sun reappear. Photo: 850mb Temperature, Height and Wind map showing cold air over the Great Lakes Region ideal for producing lake effect snows. Image generated from pivotalweather.com on December 29, 2017. ​Based on the forecasting factors, travelers will need to be aware of changing conditions based on their proximity to lakes. Short term forecasts and nowcasting is crucial to understanding where these bands could hit and who can be affected. Snows like these can mean significant accumulation to nothing in as little as 40 miles distance. Ultimately, preparation will be important as these storms can be deceiving since they can occur during high pressure systems, meaning that a strong winter storm can pass by with high pressure behind it, but still bring more accumulation near a lake. Awareness of the situation is important along with staying up to date with changes throughout the day. To learn more about other interesting winter weather topics from around the world, click here! ​Lake-effect snow primarily affects the Great Lakes region of the Midwestern United States but can have an impact on any region near a lake, capable of the ideal temperature differential to form these snows. The difference of 13 degrees Celsius in lake water temperature and air one mile above the surface is the ideal and primary ingredient necessary to form lake-effect snow. While there are other bodies of water that can have this effect (rivers, oceans, etc. ), the focus of this discussion will be on lakes. The intensity of these storms can create snowfall rates of 2-3 inches in an hour and have liquid rain to snow equivalent (in inches) ratios anywhere from 1:15 to 1:30. Due to stronger updrafts (faster rising air) from the temperature differential over the lake, this leads to a higher ratio, higher snowfall rates and greater impacts to travel. The Great Lakes is the most common region where this phenomenon occurs, impacting the surrounding coasts based on the wind direction steering the snow bands. Typical lake-effect snow events are steered by a variety of north winds that brings in cold air needed to generate this phenomenon. Other locations with bodies can experience lake-effect snow like the Great Salt Lake in Utah and the finger lakes in New York. Regions can also experience ocean, river or sea-effect snow if the conditions are right. There are multiple types of lake-effect snow bands that can occur based on wind direction and can have various impacts. Short lake axis parallel (SLAP) bands are often multiple small bands that follow the short axis of the lake and impact multiple smaller areas. Long lake axis parallel bands are often single bands following the long axis, usually creating a larger band with impacts over a single greater area. Other types of lake-effect snow are those that make multiple lake interaction, form and remain mainly over the lake, and form a vortex (or a small scale low pressure system, often called a meso-low) that can bring snows onshore. Due to shifting wind directions and weak synoptic (large scale) winds, vorticies can form within the snow band or over the lake. If stronger winds were present, a vortex will generally break up, but with cold air present and weak wind directional changes they can form and bring snow inland. 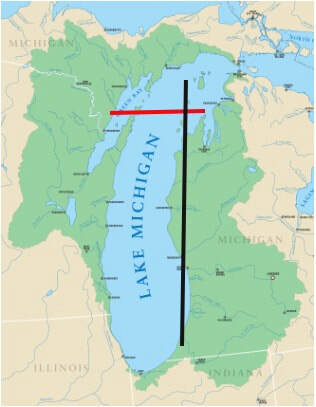 Photo: Map of Lake Michigan with red line indicating the Short Axis of the lake and the black line indicating the long axis of the lake. Image courtesy of the University of Michigan. ​Terminology can often be confused when discussing lake induced snow events and how they impact a region. Since there is a difference between lake-effect and lake-enhanced snows, the distinction is necessary to discuss. Lake-effect produces snowfall as an effect of the presence of the lake, thus if the lake were not present, then the temperature differential needed to form the band would not exist. On the other hand, lake enhancement will enhance the snow production of a lake-passing system because of cold air aiding the development of clouds while passing over the warmer waters. Understanding the nature of different types of lake-effect snow will help determine the impacts to a specific region based on the size of the bands. Forecasting is difficult for lake-effect snow because of the mesoscale nature of the event, but there are multiple processes that we can use to better that prediction. Nowcasting becomes necessary to concentrate on the changing structure of the bands and pinpoint the direct impacts to a town. Overall, lake-based snow systems are location dependent on proximity to a lake and how far inland these systems can impact. The best practice during winter storms would be to be aware of and prepared for rapidly changing conditions in real-time to determine the impacts to your specific location. Of all the media attention the polar vortex has received in recent years, the majority of people just know it as “a system that brings cold air to my city every winter.” Although this is a true statement, let’s discover together what exactly the polar vortex is. After all, the term “polar vortex” has been in use even before the Civil War. The polar vortex is a low-pressure system that resides over the poles with its strongest extent during the winter months. It is strongest in the winter because of the vast temperature contrast between the Polar regions and the mid-latitude regions. People often associate the polar vortex with cold fronts that produce snow. Although this vortex does bring a punch of cold air, the association of it with snow is simply not the case. The polar vortex primarily occurs in the stratosphere, a layer of the atmosphere about 6-30 miles above the troposphere where most of the weather occurs. Although it is 30 miles above the ground, it still has a profound impact on day-to-day weather. 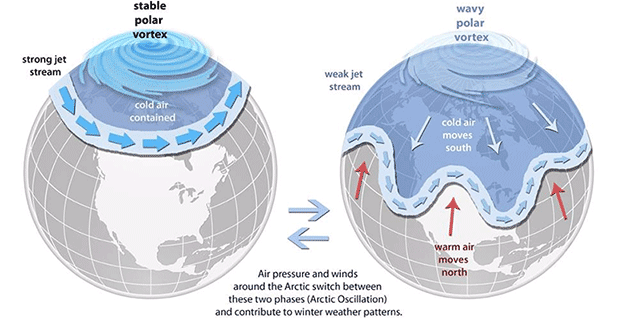 Changes in the stratospheric polar vortex can effect jet-stream patterns by forcing them southward which in turn can influence the location and persistence of cold air masses across North America and Europe. Here’s the kicker: when the polar vortex is strongest, we are less likely to see a deep cold air mass plunge into North America or Europe. It’s actually when the vortex is at its weakest, when we typically will see the cold air punch. An easy analogy to remember this would be when it is strongest (like in the left picture above) with no waves, it keeps the cold air at bay, kind of like a barrier. When it is at its weakest (like in the picture on the right) with multiple waves, the cold air rushes through the barrier and into North America and Europe. Like North America and Europe is currently seeing, the polar vortex occasionally weakens. This is due to energy being brought upward from the lower atmosphere. This happens when the stratosphere suddenly warms, an event referred to as sudden stratospheric warming (SSW). This event raises temperatures to about 50 degrees Fahrenheit, or more, in just a few days in the stratosphere. Although this event sounds rare, it occurs at least once every other winter season. This sudden warming disrupts and weakens the polar vortex which shifts the location of it southward and can physically split the vortex up. When this happens, the weakened vortex forces the jet-stream to become more prone to “blocking.” This blocking usually happens in colder months and can easily break down the “cold air barrier” as stated earlier. This leads to a more persistent cold weather pattern for weeks. A lot goes into fully understanding the polar vortex. Even more goes into forecasting it and knowing exactly when or if it will impact weather patterns across North American and Europe. As we travel through colder weather months, the ever-impending polar vortex may soon make an appearance but before that happens, much more forecasting is needed. 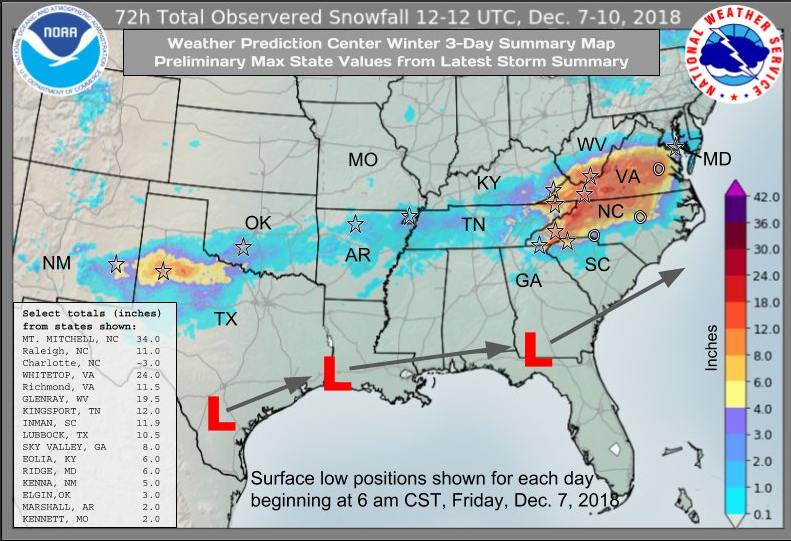 DISCUSSION: An early December winter storm made its way across the southern United States with past week. The storm initially impacted southern California on Dec. 5th, 2018. It brought heavy snowfall to the mountain regions, with some areas recording over a foot of snow. In the lower elevations and closer to the coastline, extreme rainfall lead to flash flooding from Los Angeles to San Diego. According to the NWS San Diego, rainfall totals from the storm were greater than 4.5 inches in some places. John Wayne Airport received 3.5 inches while the San Diego International Airport received 2.6 inches. In addition to causing flash flooding, the extreme rainfall triggered mudslides, resulting in road closures, including the Pacific Coast Highway, and evacuations in areas that recently evacuated due to the November wildfires. However, a silver lining does exist for California, the early season snow has resulted in a higher than average snowpack in the Sierra Nevada Mountains. California relies on the melting of this snowpack in the spring to recharge its reservoirs to support their water demand during their dry season in summer and early fall. After impacting southern California, the storm traversed across Arizona and New Mexico before moving into Texas, with heavy snow and rainfall impacting the state. In northern portions of Texas heavy snowfall occurred and places like Lubbock saw as much as 10 inches of snow from the storm. Meanwhile, rain was dumped across the Houston region, resulting in major flooding. Some places saw over six inches of rainfall, while College Station broke its daily maximum rainfall record with 4.01 inches of rain on Dec 07, 2018. According to the NWS Houston/Galveston the previous record was 1.70 inches in 1931. Moving out of Texas the storm traversed across southern Louisiana, the Florida Panhandle, and into southern South Carolina. As it tracked eastward, snowfall continued to fall within the northern portion of the system, bringing snow from southern Oklahoma to the Mid-Atlantic Mountains. The heaviest of this snow occurred in the Blue Ridge Mountains in North Carolina and Virginia, with some areas in recording over two feet of snow. One place in North Carolina, the small town of Busick, which is located in the mountains of the state, saw 34 inches of snow. Meanwhile areas not in the mountains saw record breaking snowfall. The Raleigh/Durham international airport North Carolina recorded 7 inches, which is a record for Dec 10. Additionally, the city of Raleigh saw the most snowfall in a single day in the month of December since 1958. Furthermore, this event resulted in the city already exceeding their yearly average snowfall of 7 inches. Another record was set, the second highest single-day snowfall total, at the Richmond International airport in Virginia, which recorded 11.5 inches of snow on Dec 9, 2018. When all was said and done, this early winter storm brought snowfall across the southern US, from CA to VA and heavy rainfall to many locations. It resulted in road and school closures, thousands of cancelled flights and car accidents, hundreds of thousands without power, mudslides, flash floods, and, unfortunately, some deaths. 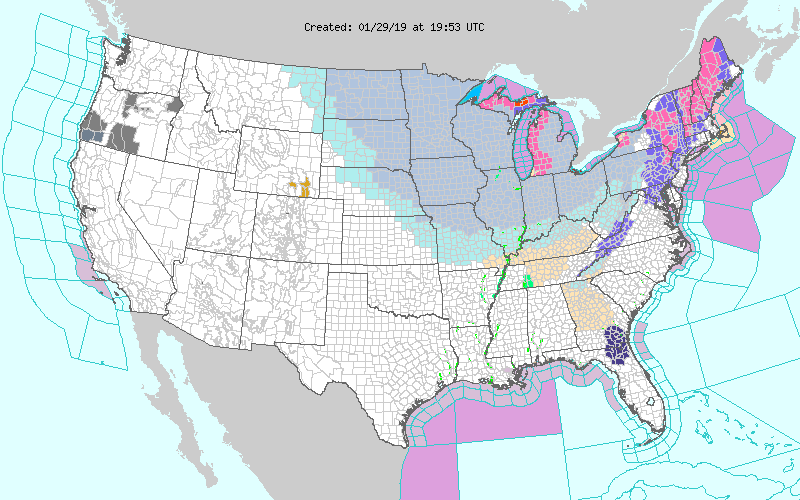 The system is now off the eastern coast, over the Atlantic Ocean but it is still driving freezing temperatures and gusty winds across the south, resulting in freeze warnings extending into Florida. © 2018 Meteorologist Sarah Trojniak, Ph.D.